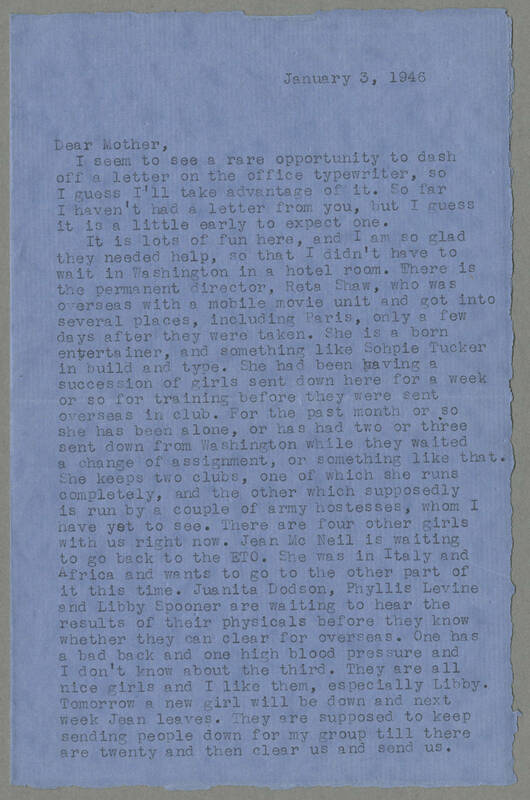 January 3, 1946 Dear Mother, I seem to see a rare opportunity to dash off a letter on the office typewriter, so I guess I'll take advantage of it. So far I haven't had a letter from you, but I guess it is a little early to expect one. It is lots of fun here, and I am so glad they needed help, so that I didn't have to wait in Washington in a hotel room. There is the permanent director, Reta Shaw, who was overseas with a mobile movie unit and got into several places, including Paris, only a few days after they were taken. She is a born entertainer, and something like Sohpie Tucker in build and type. She had been having a succession of girls sent down here for a week or so for training before they were sent overseas in club. For the past month or so she has been alone, or has had two or three sent down from Washington while they waited a change of assignment, or something like that. She keeps two clubs, one of which she runs completely, and the other which supposedly is run by a couple of army hostesses, whom I have yet to see. There are four other girls with us right now. Jean Mc Neil is waiting to go back to the ETO. She was in Italy and Africa and wants to go to the other part of it this time. Juanita Dodson, Phyllis Levine and Libby Spooner are waiting to hear the results of their physicals before they know whether they can clear for overseas. One has a bad back and one high blood pressure and I don't know about the third. They are all nice girls and I like them, especially Libby. Tomorrow a new girl will be down and next week Jean leaves. They are supposed to keep sending people down for my group till there are twenty and then clear us and send us.